I had no clue what I was getting myself into that first summer I served as a camp counselor. I grew up near Tampa, FL and had never been to a camp before. My best friend suggested I apply to the camp where he had been accepted to work, so I did…And a short time later, I received a call from the camp director informing me I had the job. I was excited to be working all summer with my best friend and traveling to a new place. Lesson Learned: Stepping into the unknown is simply that, the unknown, and you’ll never know what is there until you take that first step. The camp was located in South Alabama near the Florida line. I had never been to Alabama before and was excited to meet new people. I had a perception of the way people in Alabama dressed and wanted to “fit in,” so I bought tight-fitting Wrangler jeans, button down long sleeve shirts, and a belt buckle. When we got out of the truck upon arriving at camp, I quickly realized that we did not travel far enough on I-10 West for my outfit to “fit in.” So I changed into my shorts, tall socks, BMX shirt and shoes! Lesson Learned: Always be yourself! Fitting in sounds good until you look around and realize you’ve lost touch with the real you. I remember, as we got closer to the camp, the people passing in the opposite direction would smile and wave from their vehicle. Southern hospitality and charm was alive and well in South Alabama. That was totally foreign to me but it left a lasting impression. I remember being overwhelmed at how welcoming and friendly the staff was. Everyone would greet us with a smile and a wave. Lesson Learned: A smile and a wave can change everything! Being a camp counselor will teach you the value of treating others the way you want to be treated. We were given a tour of the camp and I vividly remember being so impressed at the effort they put into maintaining the property and how beautiful the centrally located lake was. I do not remember anything standing out as flashy or extravagant but, rather, it all had an intentional simplicity that complimented the surroundings. There was a noticeable sense of ownership, worth, and pride that went into the work done there, as if everyone knew that it was all being done for a greater purpose. Lesson Learned: Be a good steward of what you have. Be thankful for what you have. Always consider the big picture. One of the things I anticipated most about working at camp was meeting new people. Though most of the staff that summer were new to camp, we bonded quickly, in spite of all our differences. We grew to trust one another and, most importantly, rely on the Lord. Most of us were taken out of our comfort zones and forced to adapt to our surroundings. The love and support from the full time staff helped tremendously in that process. Lesson Learned: Serving with others who desire genuine spiritual growth will provide lifelong relationships and authentic community. We worked through our differences as individuals and grew into a more cohesive summer staff. We had new campers every week and, with them, new difficulties to work through. Like each of us, the campers had their own “baggage” that weighed them down, from issues back home to broken relationships. Full days of fun camp activities combined with late nights and earlier mornings made the days seem LONG but the weeks even shorter. Operating on minimal sleep made us appreciate the value of REST! Lesson Learned: Redeem the time that you have. Working at a camp will help you understand and love kids of all ages sacrificially. The camp provided training that was designed to prepare us to effectively do our jobs. It was at camp as an 18 year old that I did my first complete load of laundry (sort, wash, dry, and FOLD). As embarrassing or simple as that may seem to most, it was a defining moment of independence for me as I walked back to my cabin from the guys’ laundry room, sniffing my clean folded laundry. We were expected to make sure we provided a safe and fun atmosphere for the children, which is a formal way to say “Keep the kids alive.” Lesson Learned: The training that camp provides will help develop valuable leadership skills that go beyond the camping world. An absolute highlight from my time as a counselor was sharing the gospel with kids. Having a staff that invested spiritually into me so that, in turn, I could invest into campers and show the love of Christ was a real joy. There was an intentional effort to saturate the campers and staff with spiritual formation opportunities. Each week there was a missionary sharing every morning about what God was doing to advance His kingdom. Every week there was a speaker sharing the Word of God each night in chapel. Throughout the day the campers had Bible classes to attend and quiet times to work on memory verses. As counselors we were expected to prepare and lead devotions every night for our campers. Lesson Learned: Most importantly, take full advantage of the endless opportunities for discipleship. Working at a Christian camp will prepare you well to communicate a clear gospel message to people of all ages. 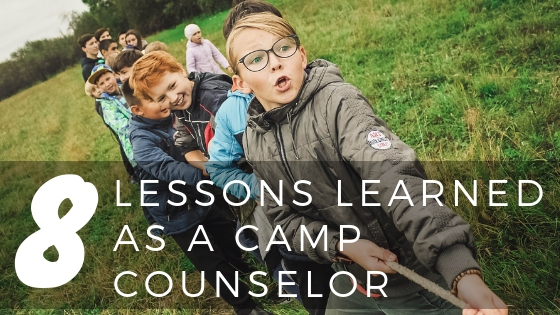 3 Replies to "Lessons Learned as a Camp Counselor"
What a great article, Nate. Your first summer at camp was the first time that we met and began a wonderful journey of friendship. I thank God for your testimony. And I thank God for Camp Victory. So well written Nate. I would have to say my years there and the lessons I learned was Gods way of preparing me for my years of being a nurse. You do a great job. Being a counselor at Camp Victory truly is a blessing and does prepare a person to better serve the Lord. Prayers for all camps this summer and the people who serve.